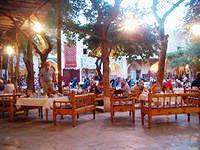 «Lyabi-Hauz» Restaurant is located in the centre of Bukhara. Skillful cooks of the restaurant always offer you the most delicious national and European dishes, the taste of which will remain forever in your memory, because each dish is cooked here is a kind work of art, and good humor and kindness will be your constant companions. Visiting this cozy place near the pond of the architectural complex Labi-Hauz, you will plunge into the world of an ancient civilization and history. «Lyabi-Hauz» Restaurant accepts orders for service groups and group activities. If you reach architectural complex Lyabi-Hauz, you will see the beautiful view of the restaurant «Lyabi-Hauz» which combines the architectural traditions of the old East.